Pretty simple really. Once I walk out the door on a Friday night I know I have a couple of days with my family. We eat, drink and spend time together without the frantic craziness of our Monday to Friday lives. Normally we order some takeaway and enjoy a good bottle of wine. 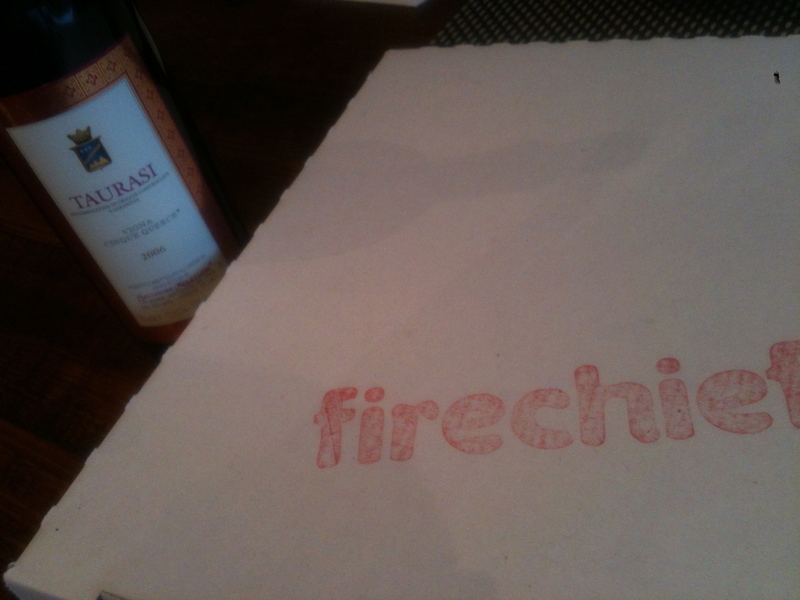 Takeaway for us last night was wood fired Pizza’s from our new local Firechief which is just down the road. We started with a half bottle of Louis Roederer NV before moving onto a bottle of Salvatore Molettieri Vigna Cinque Querce Taurasi 2006 which was spectacular. I opened the bottle Thursday night just to have a quick look at it and also give it some air. With 24 hours, open in the bottle this wine was mind blowing. Can’t wait to show it in Oz in a couple of months time. Previous PostLast night’s Hoddles Creek Estate Winemaker dinner….Next PostLe Moire Vino Calabrese on the way to Oz…. A fantastic article on Vittoria….